What has the electromagnetic spectrum done for you lately? I’m guessing not a lot. But it can. 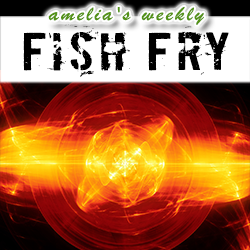 In this week’s Fish Fry, I sit down with Hayden Nelson (Abaco) and discuss the future of electronic warfare. Hayden reveals the what, where, and how of cognitive electronic warfare, how spectral allocation in wireless communication can be a battlefield game-changer, and why open standards are critical to the evolution of warfare communication technologies. Also this week, we check out a funny story coming out of the Ohio Department of Rehabilitation and Correction that involves five incarcerated cyber criminals, unauthorized network access, and two kluged together personal computers found in the ceiling of a prison.